An engagement ring, circa 1880s. I get to look up really fun things when I write historical fiction. I’m writing Western Steampunk so I get to do research into the American Victorian era and the Wild West. For anyone out there who might be interested in such things, I highly recommend these books for everyday life information (food, clothing, hobbies, slang, furnishings, courtship, mourning, etc): Everyday Life in the Wild West and Everyday Life in the 1800s. They are out of print but you can still find used copies through the Amazon Marketplace or Half.com. Sometimes, I end up poking around the internet for things the book can’t cover. I was curious as to what engagement rings of the period looked like as my recollection of the whole “Diamonds Are Forever” marketing campaign being later. For the records, diamonds were used but not as the default gem like today. 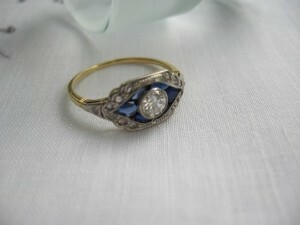 I found a gorgeous ring poking around for 1880s engagement rings and thought it was rather pretty. I also found references to engagement rings coming in silver boxes upon purchases which I thought was a neat detail. Apparently some people collect those boxes. Tabor Grand Opera House was first opened in 1881 in Denver. I also had cause to look up opera houses of the time. I was lucky that the time period I had picked including the building of a lot of things I can fit into my story. While Steampunk lets me make the setting a little alternate, I do like to drop in those real historical tidbits for flavor. It does help make the world building easier when I can play with what already existed. The interior of the Tabor Grand Opera House. So pretty! The opera house that matched my time period is the Tabor Grand Opera House, which was funded by a very prominent member of the city. The Tabor Grand Opera House no longer exists (it was taken down for good in the 1960s), but the surviving pictures show that it was a stunning building and I think it’s a shame it’s no longer standing. The interiors were just gorgeous and no expense was spared when it was created. Thank heavens the Denver Public Library has an online photo archive for historical purposes. Makes my research easier. Note to writers, sometimes it’s really nice when your period of choice includes photograph as painting are not as greatly available and could be manipulated a bit more. This entry was tagged 1880s fashion, 1880s jewelry, historical research, novel research, steampunk, victorian jewelry, Western Steampunk, work in progress, writing, ya fantasy, ya fiction.